At ServiceDesk Plus, we’re constantly thinking of ways we can make it easier for your users to ask for and receive help. Since 2003, ServiceDesk Plus has helped thousands of IT service desks worldwide deliver awesome service to their customers. So, when it comes to your IT service desk, we’ve got you covered with ITSM best practice workflows, codeless customizations, and smart automation. For the past year, we’ve been working on that same goal in a slightly different context. The IT service desk is not the only place where your end-users seek help. There are several other areas in an organization—such as HR, facilities, and administration—which constantly battle problems similar to those of an IT service desk. These issues include unorganized request management, inefficient processes, productivity leakage due to lack of information flow, etc. And the solution to these service management challenges comes from none other than your IT service desk. Introducing the new and enhanced cloud version of ServiceDesk Plus, which takes IT best practices beyond your IT to your other business functions. One organization. One portal. Multiple instances. 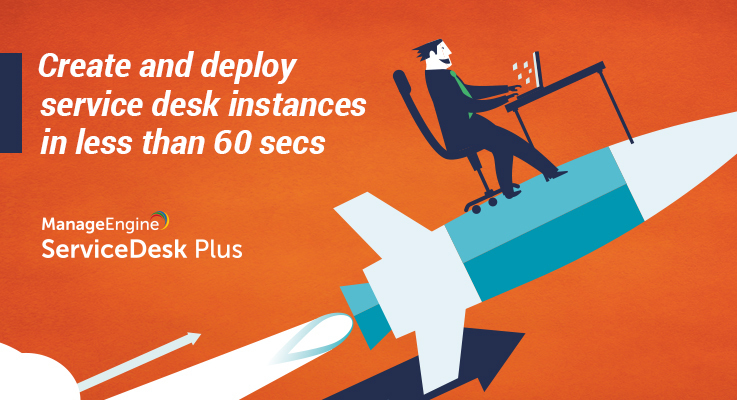 With the updated cloud version of ServiceDesk Plus, you can create multiple instances for each of your business functions in under 60 seconds. Single enterprise directory: A one-stop shop for all your internal services. Unique service desk instances: Code-free customizations to create unique service desks for each of your business functions, including HR, facilities, finance, travel, and IT. Service automation: IT automation and workflows to meet your business needs. Built-in catalog and templates: Instant deployment of service desks unique to each of your business functions. We encourage you to give our rapid-start enterprise service desk a try and see for yourself the value it can bring to your organization. Test drive our enterprise service desk today!